How many pallets deep and how many pallets high can we go? This is the question we are asked most often. Our answer is 2–6. 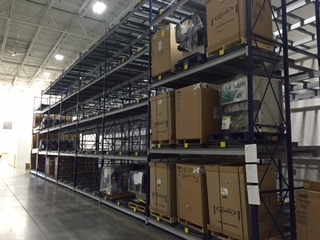 Most of the racking manufacturers we work with max out at a depth of 5 pallets. However, there is one manufacturer we work with whose racks accommodate up to 6 deep. If the pallets are 1000# or less, we can go 3 pallets wide. If you’d like to get a quote, call us at 800-821-1054 or contact us online. Higher density storage: But you must have 6 or more of the same SKU. If not, double reach and selective is probably the way to go. Less product handling/damage: The key is to use high-quality pallets to have the most economical system. Faster picking vs. drive-in racks: It’s faster because you put away and de-shelve from the front. Safer: Forklift operators never enter into the system or need to maneuver in tight spaces. 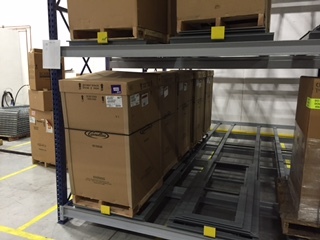 We’ve found that the food and beverage industry and operations that have few SKUs, but use lots of pallets, benefit the most from installing a push back system. 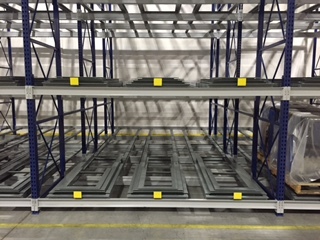 We can install three types of racking (Hook & Slot, Teardrop, and Structural) depending on your specific storage needs. Ideally, you need three or more of the same product for ease of not pulling pallets out in order to access a pallet behind them. You must have selectivity in the front. If your operation doesn’t fit into this mold, you might want to consider a double reach racking system or another solution. 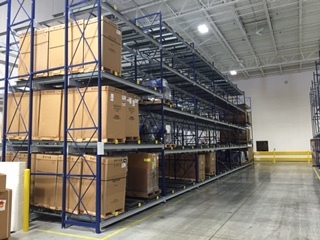 You can expect an up to 60% increase in efficiency compared to selective racking, and up to 33% increase compared to double reach racking. Price per pallet typically ranges from $275-$325, depending on quantity and depth needed.